Fuller has the build and core skills of a future NFL starter, but his status as a top-tier player at his position in this class is now questionable due to an inconsistent senior year. 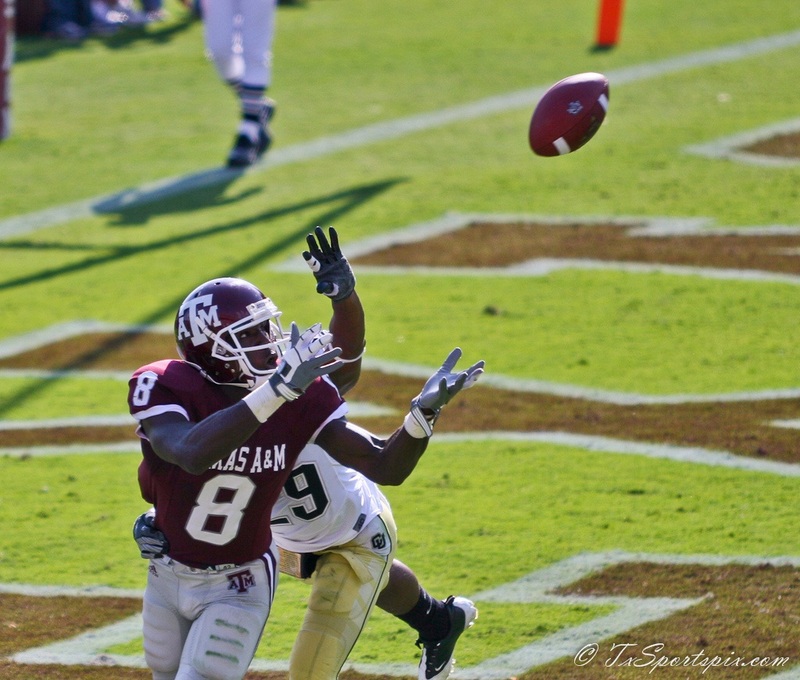 This Q&A of Texas A&M wide receiver Jeff Fuller took place at the Senior Bowl’s media night. I was unable to identify the reporters at the beginning of this session so I have labeled them Reporter 1 and Reporter 2. Fuller is a 6’4”, 217-pound receiver with experience in a pro-style offense brought to College Station by former Green Bay Packers head coach Mike Sherman. Here’s what Fuller had to say about his up and down senior year, his learning progression during his college career, and what he expects to face during his transition to the NFL. [Reporter 1]: You were one of the top wide receiver prospects at the end of your junior year, but you had a tough senior campaign, had difficulty catching the football, and it seemed like you became a bad player over night? Was it hard for you? Fuller: Yeah it was really hard. I dropped a lot of balls and it was out of character for me. But I’m not here to make excuses. I’m here to show everyone what I can do. I don’t have anything to hide in my game so this is just a fun trip for me. [Reporter 2]:You were coached by Coach Sherman a former NFL coach during your career can you tell us about what you learned from him? Fuller: Coach Sherman couldn’t have prepared me any better for all of this. Last year Von Miller went through and he told me that we were going to be further ahead because we’ve had former NFL coaches and I believed him. Von is a freak of a talent. It really was true. When we went through the offense a lot of the schemes and terminology is really familiar. It’s fun to jump in there and compete. [Reporter 1] Someone who hasn’t seen you play can you tell them what you bring to the table? Fuller: If the ball is out there I’m going to go get it. Strong hands. Quicker than most big receivers in and out of my breaks. [Reporter 1] What are the things you want to work on, especially before the NFL Draft? Fuller: I can’t even throw any weaknesses out there. I want to get better at my strengths. I think the best pros work on their strengths and I just want to continue to get better at what I’m good at. [Reporter 1] Do you feel like you have something to prove? You were one of the top receivers last year but this year not so much. Fuller: I try not to pay attention to where I’m at in the draft. Whether my stock is sliding down or jumping up I just trying to take care of the stuff that I can control. All that I can do is come out here and work hard and that’s what I’m doing. Yeah, I guess I do have a little bit of a chip on my shoulder because I didn’t accomplish the things that I wanted to accomplish this year for myself. It’s good for me to come out here and do what I can do. [Reporter 1] Would it mean something you to be the top receiver taken in this draft? Fuller: Of course, that’s why I came back. That’s what I’m shooting for and why I’m working hard every day. [Reporter 1] There’s a Big 12 receiver they are already calling that. Do you think you can do what he can do? Fuller: I’m going to let you guys be the judge of that. I don’t feel like I have anything to hide in my game. Waldman: Tell me about your role in the Texas A&M system and the type of plays you enjoyed running and what that entailed. Fuller: Well this year I was pretty limited within the system by the routes that I ran, but when you look at my body of work from all four years there’s plays that I ran my freshman year that we didn’t really run my senior year. Just going through the playbook with two receivers one side and one on the other side and backside plays with comebacks and fades. Waldman: So what differences do you anticipate seeing in the NFL that didn’t see in the Big 12? Fuller: The schemes and terminology will be the biggest jump from college to the NFL. In college it’s just go out there and do it. In the NFL there’s a lot more thinking. You have to read Cover 2 and Cover 1, you have to know how the corners are going to press you, etc. So coming out here and having the coaching staff telling you different things like sticking the defender at the top or a certain route is supposed to take a certain depth, I’m fortunate that I had former NFL coaches because I know what they are talking about. Waldman: What did you learn during your summer working with Larry Fitzgerald? How did it help your approach to the game? Fuller: Larry and Coach Jerry Sullivan. Larry likes to get all the players out there and beat them up. He’s a hard worker. I’m a hard worker as well, but he makes a point to outwork you and that tells you a lot. Coach Sullivan really helped me out a lot about sinking your hips and getting in and out of breaks and all the really small things like not letting your hands flare out and that your feet are the only thing that can bring you out of a break because a lot of times when you want to come out of breaks fast you start twitching and torqueing your body and that’s when you slip and fall. So at a practice like this [Monday] when the field is wet, technique really comes into play. That helped me out a lot. Waldman: Interesting point because I was at the North practice and one of the things Coach Stewart talked about to his receivers was keeping the head in one position in and out of your break. It was instructive to see what he was reviewing with his players before practice because every receiver here as a different experience level with the craft and techniques of the position. Mike Wallace was here a few years ago talking about how he never got coaching at the position at Ole Miss and these points were all new to him. Fuller: It’s crazy to think about and I went through it my freshman year. When I got there I thought, ‘Man, I can’t do anything right. They’re getting on me for everything.’ I think I’m running routes well and my teammates think I’m running good routes and I first wondered why they were dogging me so bad, but I completely understand now and I can see what they were seeing. Especially with them coming from the pro level to the college level – their coaching definitely prepared me for this. There’s definitely something new to learn. I can always learn something new every day. While I’ve been at A&M I’ve had three different receiver coaches. Some of them teach things different ways, but you come to realize that you have to pick up something from everybody because everyone has something of value. I feel lucky coming here because I’m working with the Redskins receivers coaches and picking up on them telling me. It’s good experience to be here and pick up what they are teaching.